Time and again we are asked by Realtors, reporters, and everyone else, what the magic recipe is for success. How our agents find it, and how we as a firm have found it in such a relatively short period of time. They pose this question as if the answer could be written down on a notecard. A few short lines. The reality, however, is that there is no secret, and the closest thing to it is the quote above. What has led us to success is that we aren’t looking for it, and certainly don’t believe we have found it. We just keep going and doing, doing and going. Sure, our efforts are concerted and our approach is targeted, we’re not just throwing ‘spaghetti at the wall’, but we don’t believe in success as a destination and there is always more that can be done. This same mentality is what defines our Top 25 every quarter. We have a bird’s eye view of the situation, and what we see is that the Brokers and Agents who make these top Realtor lists are the ones who understand that in order to achieve more they must do more. They don’t chase shortcuts. They hustle, and they stay the course whether business is slow or fast. This past quarter we had some interesting moves, and even more impressive is that 26-47 is a 21 way tie! This industry is dynamic, whether you’re a brokerage or a Realtor, you’ve got to keep moving forward or you will be passed! Cheers to everyone who made the list, and cheers to all the hunger that drives us all! 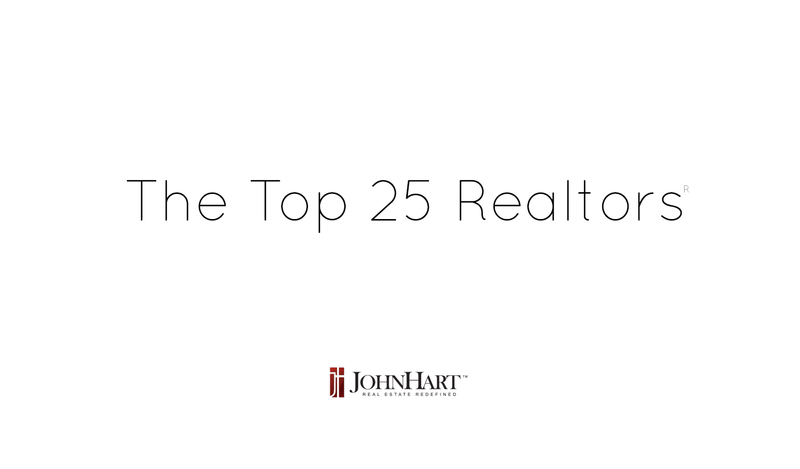 Here’s your Top 25 JohnHart Realtors! View the previous Top 25 Realtors List by Clicking Here! View Off Market Properties and New Listings Here!